“Owen Driggs” is the collective identity of Matthew Driggs and Janet Owen. 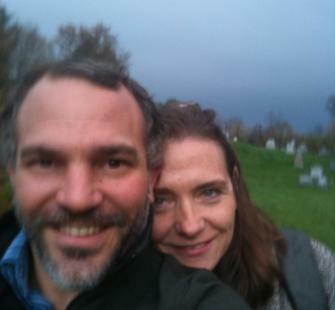 Individually experienced artists, educators, and curators, Janet and Matthew began their professional collaboration in 2007, after the spectacular success of their first major work, their son Theo. Together, as Owen Driggs, their practice focuses on the production of space and the impact of spatiality on action and discourse. Initial works included a series of large-scale, hand drawn maps that elucidate aspects of Los Angeles history and Big Blue’s Dirt Park: a mobile opportunity to dig in the earth while learning more about local land use. Since 2009 Owen Driggs have operated a multi faceted initiative titled Performing Public Space, which explores and supports the diverse ways in which citizen artists activate public spaces. Aspects of Performing Public Space (PPS) include an eponymous exhibition and site specific performance series, which debuted at Tijuana’s Casa del Tunel. In 2010 Owen Driggs exhibited and performed at the Los Angeles County Museum of Art where, having been invited by artists and curators Fallen Fruit to create a garden for Let Them Eat LACMA, they presented Roots of Compromise (with Ari Kletzky, John Birtle and Karen Atkinson) (ROC). A “garden of verbiage”, ROC navigated multifarious bureaucratic and legal pathways in an effort to grow produce on public land.